The opportunity for judging others seems to be at every turn. Although my primary purpose for attending alcoholism support group meetings is to be kinder to the alcoholics in my life, I find that the principles I learn there help me to not be so harsh on others throughout every area of my life. When I go to the grocery store, if someone ignores me and cuts in line, I pass judgement on them. When I am trying to resolve an important financial issue and the other party is not cooperating, I have a tendency to get angry and judge them. Believe it or not, it seems like every time I get in the car and travel, there is always someone who isn’t driving the way I think that they should. I think we all have our individual pet peeves. What are some of yours? Is the problem with me or with them? Who is trying to be in control of everything and everybody? The key to having more peace and serenity in our lives is realizing that as hard as we may try, we have no control over people, places or things. This is why learning how to let go of an alcoholic is so important. I think that the idea of judging others extends into every area of our lives, not just when we are dealing with an alcoholic. Why is this particular subject so important to consider opening the door to? When we pass judgement on others, our peace and serenity is at risk of being lost. Sure when we are living with an alcoholic it’s easy to place the blame on them for everything being wrong in our lives. The truth of the matter is that being happy is an inside job. You and I can find contentment and happiness whether the alcoholic is drinking or not. The idea that someone else is responsible for my happiness is absurd. Overcoming the habitual patterns of judging others takes work. This work begins with our thoughts. How we react in actions or in our thinking patterns determines the level of peace that we enjoy. When a person buts in front of me at the grocery store, I have a choice. I can get angry or think for a moment that perhaps they are on their lunch break and they only have a few minutes to get lunch. Giving another person the benefit of the doubt can do wonders for our disposition. When we give up the right to be offended, it’s harder to be guilty of judging others. Awareness plays a huge part in how we react to others. 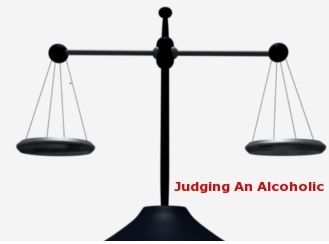 When we truly see the alcoholic as having an illness, then we judge them less. The awareness also needs to be combined with acceptance. These are two of the foundational factors that can lead us into having more peace in our lives. When we can come to grips with the fact that nothing we have done or said has caused the alcoholics in our lives to quit drinking, then we can accept that they have a problem that “we” cannot cure. When someone is ill with the flu, we don’t pass judgement on them for lying around all of the time. If we can adapt the same attitude toward the alcoholics in our lives, we will be kinder toward them. I have a good friend who says; “one sick person judging another sick person is sick, sick, sick.” Are you sick with judgement? On par with this article, I’m just really curious where the judgement stems from altogether. Let’s say you believe your friend to be a much bigger “fan” of alcohol than you would think is healthy for either himself or anyone else. Now assuming you’re not living with this friend, he/she has no dependents, and he/she isn’t dependent upon you, don’t you kind of have to let them make decisions for themselves? I mean, even if their health was deteriorating and you were visibly witnessing a fairly objective decrease in quality of life, isn’t that still their decision to make? I think you can express your concerns and feel comfortable withdrawing your friendship at any given time (just as you would for any other friend for any other reason), but if your friend just wants to drink then you kind of have to let them. If you’re still hanging around the person judging them when you’re not being asked to stay, your friend doesn’t owe you anything, and at this point you’re really just a jerk. I haven’t even been married a year. I love the sweet man I married when he’s not drinking. I knew he drank, but never knew he drank as much as he does. Tonight he got upset and when I tried to discuss it. He just stared blank face. I lost it and punched him in the face twice. Then cried for forgiveness. I hit rock bottom. I don’t want to be hateful. I don’t want to be lonely. But tonight all I do is cry. I was taught to love and tonight I lost his respect. How can I make myself not get so mad. To just love him and egnore him when he’s drinking. Jaye, I don’t know what the laws are in your state but the state I live in will arrest the person that hit the other one if the police come out. I use to date a cop and he said they have arrested several woman. I am NOT judging you. Just girlfriend to girlfriend, keep that in mind. Try to only talk to him about it when he has not been drinking. Got it. I don’t know where that person I became last night came from. So the key is say as little or nothing when he gets angry. Change the subject and pray.